It is that time of year for thank you card writing for gifts after the holiday season. 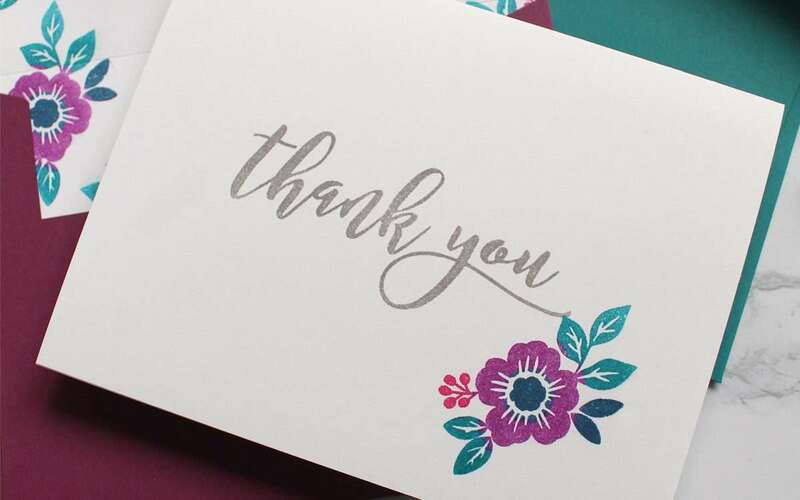 During this time, I also love refreshing my thank you card stash with new images and colors. The Silhouette Mint™ helps me make new cards with custom sentiment and image stamps created from design files in the Silhouette Design Store, in minutes! 1.. Silhouette’s Mint Studio™ software operates basically the same as the Silhouette Studio® program. 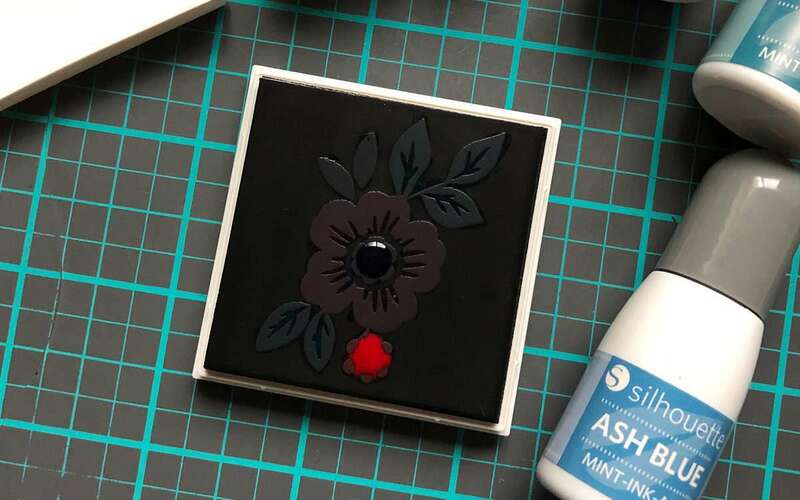 The first step is choosing your stamp base size. To do that, click on the stamp settings icon on the top right-hand toolbar to open the stamp settings panel. Then find the size listed on your stamp base. 2. Open your library and double-click the image you desire to place it on the design space. 3. 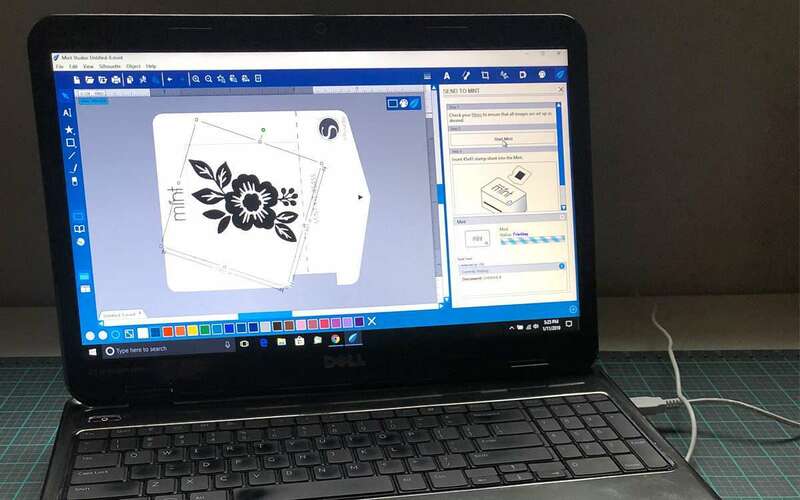 Resize the image to fit your stamp base by clicking and dragging the corner handle. 4. Go to the top menu and click File > New and repeat the same steps with the Thank You design and larger stamp settings. Note: I changed the filter settings of the flower image by taking the brightness levels and dropping them to 0% to get a solid image. Most images do not require this change. 1. When the designs are the desired size, click the Mint leaf in the right corner of the screen. 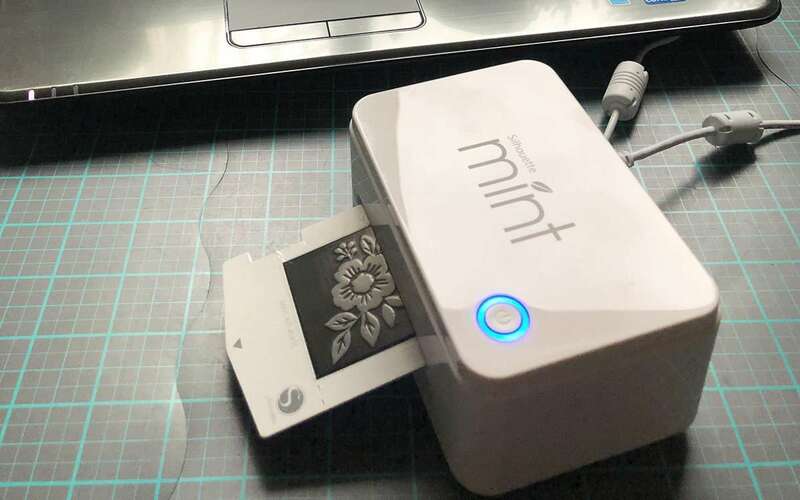 Mint Studio™ automatically reverses the image for stamping (very important when you are printing words). 2. Click “Start Mint,” and then insert your base into the back of the Mint machine. (Note: Leave the plastic covering in place!) Within a minute, your image will be complete! 3. 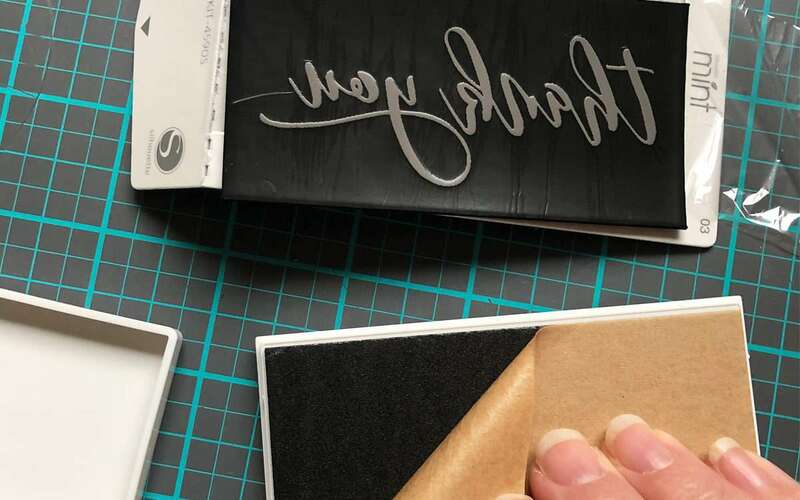 Remove the stamp base from its packaging by bending the chipboard back at the perforated line. 4. Now you may remove the plastic from the stamp. 5. Remove the backing from the plastic stamp base and position your stamp on it. Because everything is the exact same size, lining up the two portions is simple. 6. Your image is now ready for ink. 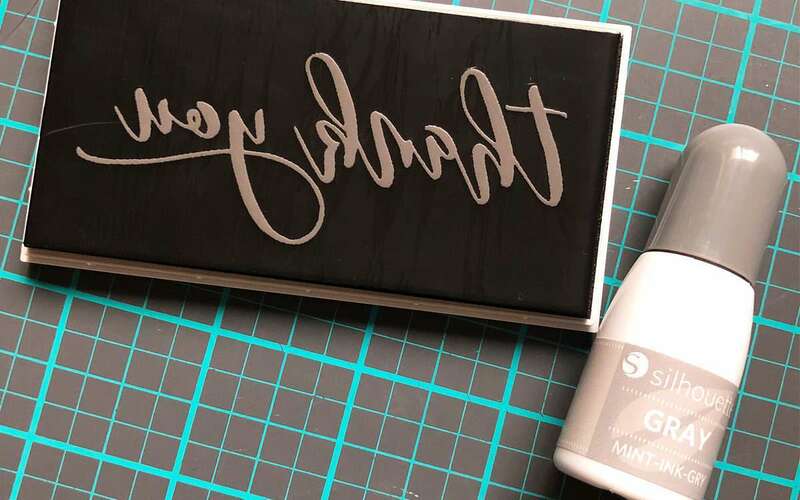 The Silhouette Mint™ stamps are designed to hold in the Mint Ink, meaning that once the ink has been added, you will go through many stamp applications before you need to add any more ink. 7. To add ink, choose your favorite color and being applying it to the light places where your image was etched. There is no need to squeeze the bottle, as it comes out easily, and a very small amount is needed. 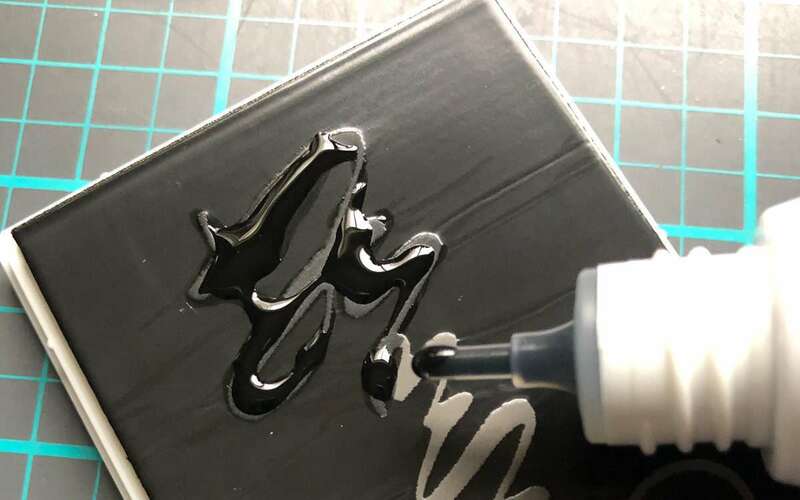 Allow the ink to seep inside for a few minutes. Then, stamp off the excess ink using a piece of scrap paper. Sometimes I get heavy-handed with the ink and get too much on the surface. If that happens, simply take a paper towel and remove the excess ink from the surface. 8. You can also use more than one ink color! For the floral image, I used several different colors of ink. To achieve this, add the ink only in the places you desire. In this instance, the leaves, flower center, flower petals, and small branch all got different colors. 1. Now your new stamps are finished and ready to be used! 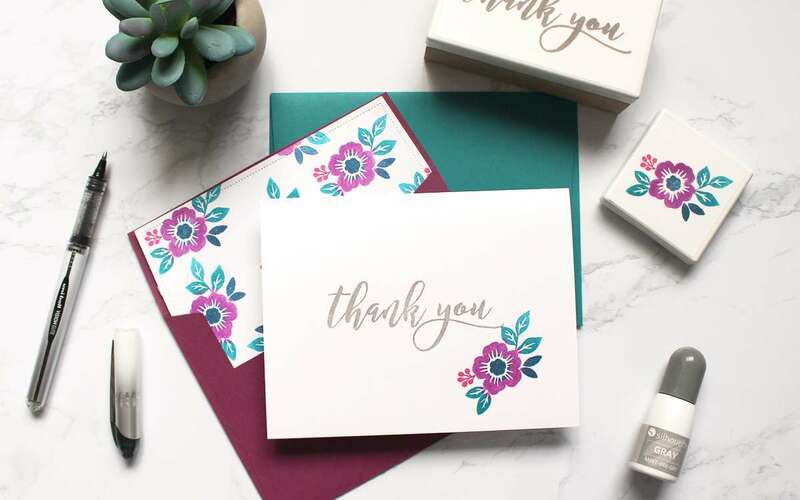 Stamp the “Thank you” first on the center of your cardstock. Then follow it by stamping the flower. 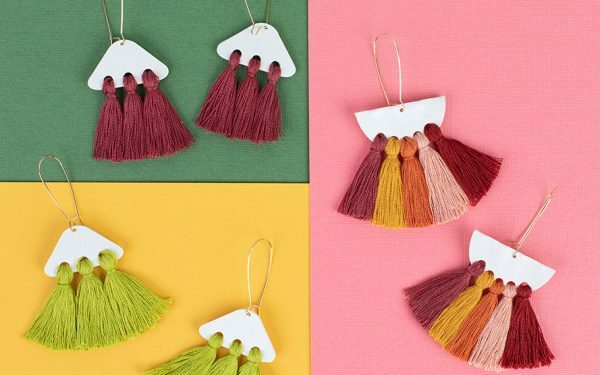 I love the scripted font and the fresh color palette of these cards! I also took things one step further by stamping the liners for my envelopes! What a classy touch! The design possibilities are endless! Make custom thank you cards for yourself, and let your kids make their own as well!